Listening Valley opens up to a scene involving two young sisters, Tonia and Lou. They live with their mother and father in the Edinburgh although they really do not know their parents very well at all. Their parents cannot be bothered with the girls and so they are raised primarily by their nanny. The stage is quickly set for the rest of the story which proceeds with a rapid aging of the girls. The majority of the book focuses on the adult life of Tonia, but you have to know her background and family history in order to appreciate the rest of this tale. Tonia is a completely identifiable character. She starts out a quiet, unassuming sort but over time - as she experiences more of life - she becomes self-confident and secure in her own person. I suppose in some ways this book could be labeled a 'coming of age story' although I hesitate to say so. (Anytime I hear "coming of age story" I think teenage angst and this book is quite short on angst and quite high on character development.) Tonia grows in maturity through a string of circumstances which includes living in London during World War II. Listening Valley was first published in 1944 and covers the time period between the early 1930's through the mid 1940's. It could therefore also be labeled "historical fiction" which I don't mind one bit as that is a beloved genre of mine. One thing that I love about Stevenson is that she places her characters into a world that she knew and was familiar with. Especially as relates to life in London during the war, I thought she did a great job explaining what daily life looked like and the habits of people post-war who had lived through the blackouts. Somehow or another she brings history to life in a way that takes you by surprise. It's very enjoyable, really. I really don't want to give much more of the storyline away because I think you should absolutely read it for yourself, so I'm going to avoid saying too much more about it. You should rest assured that Stevenson did a great job drawing me in and helping me to learn who her characters were and I feel equally assured that she'll do the same for you. This book is nothing but a good time! 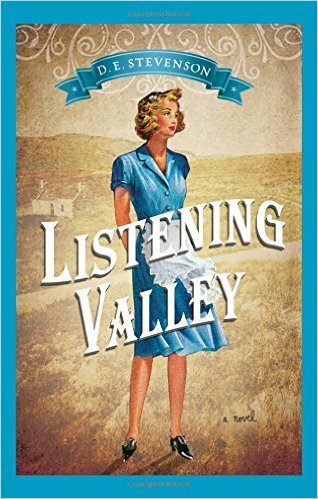 I am ecstatic and delighted to say that Sourcebooks, who have kindly been reprinting Stevenson's works, have offered to give away one copy of Listening Valley to one of my readers here at Reading to Know. Would you like to win? (Yes. Yes, you would.) Simply leave a comment in the comment section below including a valid e-mail address. This contest is open to U.S. residents only and will be open through Wednesday, November 11th. THIS CONTEST IS NOW CLOSED. THE WINNER, as selected by Random.org, IS #17 - Amy from Hope is the Word. Congrats! Even if you don't win, do track this title down. I find it hard to believe that anyone would not enjoy it. Call it blind disbelief if you like. Many thanks to Sourcebooks for not only republishing Stevenson's books, but for sending a copy of the above title my direction in order to facilitate this review and giveaway. I received no additional compensation and all enthusiastic opinions are entirely my own. I have not read anything by her yet either! Thanks for this giveaway! I know I have Stevenson on my list to read because of you...but had forgotten all the details. Now I really need to read Stevenson! I adore D.E. Stevenson - she is my favorite comfort reading in the cold, winter months. Have you read "Four Graces"? That's one of my favorites. (Probably because I identify with life as a clergy daughter.) The Mrs. Tim series is great too. I love D.E Stevenson books and am so glad they are reprinting them. Yes, Yes, I would! I just tried to see if I could find any of her books at the library sale (but, no). This title sounds good! cre8sld(at)comcast(dot)net. I'm glad you enjoyed it. I love "Listening Valley". It is my favorite D.E. Stevenson although my copy was my mom's and it is falling apart. I would love to win a copy. I'm so glad that Sourcebooks is reprinting them. I've been gradually buying them for myself and for gifts. I've bought all the reprints of the Miss Buncle series. I had never heard of D. E. Stevenson, but this book sounds absolutely delightful! I think I would enjoy reading it, too. This is a new to me author...would love to read her books. I have the first two Miss Buncle books waiting on my kindle, and my current read is too creepy for my tastes, so I will officially plan to start the first one tonight! It's past time I read them. I saw this book before and was interested due to the time period, but am now all the more intrigued that you have reviewed it.